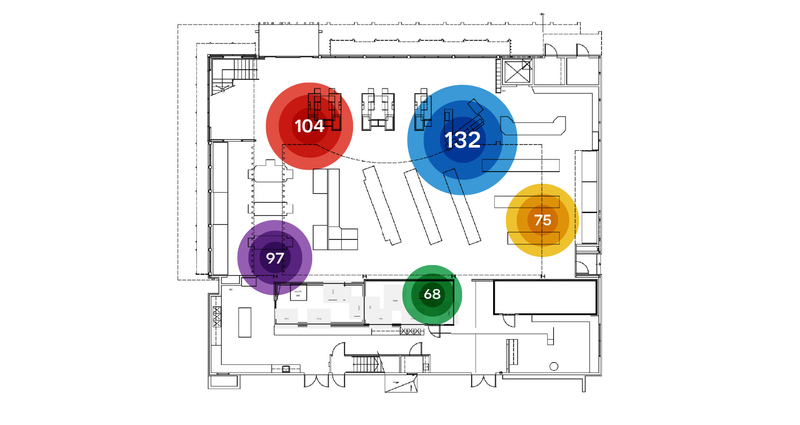 In-store analytics can say more for your stores performance. Marketers have the tool to extract valuable information on customers behavior in order to improve “low volume sales” sectors and products’ placement, upgrade the shopping experience and drive to higher revenue per shopper. Visitors and dwell time analysis provides a comprehensive analysis of the people interacting with specific product categories and the time spent in those areas. This analysis helps you measure the impact of products placement, the effectiveness of offline and digital marketing campaigns and track if your in-store marketing campaigns perform well. Real-time traffic performance, widely known as heat maps, is a real-time visualisation of store’s hot spots and dead zones. Real-time traffic performance enables you to get immediate actions as you can improve promotion actions and enhance customers service. Store’s performance optimisation becomes easier as you can see a quick impact on customers flows and sales performance. Shopper loyalty or customer retention is a central topic in management and marketing operations of retailers as it provides them with insights on how frequently customers return to store. The success of loyalty/ CRM campaigns rely on the fulfilment of this important KPI – the shopper loyalty and also contributes to profitability as the acquisition cost of new customers is reduced. Path coverage or branch coverage assists retailers know the hot departments in the context of visiting frequency. By using this metric, marketers can identify under-developed product categories, new opportunities and improve customers in-store journey. Next path analysis provides marketers a sophisticated view of shoppers visit to parent department when visiting a certain department. Marketers use this metric in order to understand how different demographics interact with products, how to improve product placement and promotions in end-caps of the corridors and enhance cross-selling opportunities. Shopper penetration funnel in a physical store is quite similar to those in e-commence as you can identify a visit in product category and how this drove to a purchase. Analysing the penetration funnel of shoppers gives retailers a fair understanding of how a simple visit in a department influence the shoppers to make a purchase decision in accordance to other factors like promotions and loyalty programs.